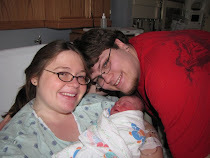 This is a blog to chronicle our beautiful baby's life. Ember Rose was born on March 2nd, 2010, and is getting bigger and bigger with every passing day! We can definitely already tell that Ember is a very charismatic baby. She started smiling pretty early at 4 weeks, and now she is talking up a storm. It started with her making a couple of sounds in her throat, but now she is starting to move her mouth to manipulate what sounds she makes. It's fun to hold conversations with her now that she can smile, talk back, and even squeal (which often gives her hiccups!). I am a 21 year old who is currently a senior in College. I live in an apartment with my husband and baby girl.